Acting with fear (without love) creates everything we don’t want – isolation, loneliness, distance and disconnection from others. Everyone has parts of their personality that feel these things. Creating authentic power requires acting from the loving part of your personality while a frightened is active (for example, while you are angry or jealous). 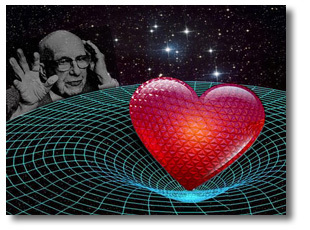 Buckminster Fuller said, “Love is metaphysical gravity.” I agree. What else could it be? Without gravity you would float like an astronaut in a spacecraft. Up and down would mean nothing to you. Your slightest motion would send you tumbling head over feet or rolling uncontrollably. If you pushed hard against a wall, you would shoot backward fast until you hit another wall. If the lights in the spacecraft went out, you would have no way at all of orienting yourself. Without love the same thing happens. Every experience of anger, jealousy, resentment, and fear sends you spinning out of control. You have no way of knowing up from down except what your anger shows you, and it always shows you that you are right and someone else is wrong, that you are a victim and someone else is a villain. The more you act in anger, jealousy, resentment, or fear, the more painful consequences you create. You careen helplessly, spinning, rolling, hitting walls you can’t avoid and colliding with others. Love grounds you. It orients you. Love brings your awareness to others and yourself. Love opens your mind and heart to others and yourself. Love settles you and gives you balance. When you choose to become sensitive and caring instead of frightened and selfish, your anger turns to appreciation, your jealousy to gratitude, and your resentment to caring. You cannot lose your orientation: when your deeds harm others you are in fear, and when you create harmony, cooperation, sharing, and reverence for Life you are in love. The ground beneath you is always solid. That is why mystics say that only love is real. Now we are all becoming able to see for ourselves that we are parts of a larger fabric of Life and experience for ourselves what Bucky saw so clearly: Gravity calls you to the Earth. Love calls you to Life. And they always will. Would you like to experience Love pulling you to Life? There is no better way than this once-a-year retreat with Gary and Linda. 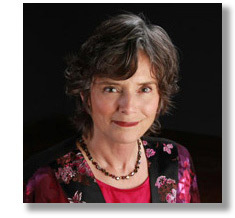 Create authentic power and spiritual partnerships with people from around the world. Enjoy the beauty of Mt. Hood, Oregon. Come by yourself, with your family, coworkers, or intimate other. 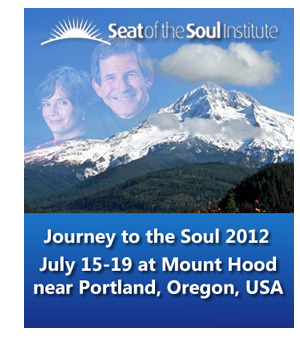 For information and to enroll, please visit our Journey to the Soul 2012 page. This retreat sells out early, so please register now if you intend to come. If you can’t come to the Journey to the Soul this year, do the next best thing: enroll today in the Awakening to Spiritual Partnership online course. This media-rich course supports you with videos, animations, meditations, interactive questions, a SoulLog and online Spiritual Partnership Community. If you are coming to the Journey, this course is the best preparation for it that you can give yourself. For more information about the course, click here. To get a 25% discount, click the Sign Up Now button, type soulconnections in the coupon box, and click recalculate. Last night I was re-reading one of my favorite books about Gandhi (Gandhi The Man by Eknath Easwaran). The first time I read it was many years ago while Gary and I were still living In Mt. Shasta, California. Our library had many books about Gandhi, but this one is the one that I was drawn to. Since then I have revisited it often. There are many photos of Gandhi in different stages of his life and therefore not so many words, but the words that the author wrote gave me such an amazing glimpse of this beautiful soul that moved millions of his fellow souls in his lifetime and is still moving us now in powerful and profound ways. He embodied real power, in others words, authentic power. I am so inspired by him. I feel his deep commitment to the truth, his willingness to experiment in bold and spontaneous ways, and the ever increasing clarity with which he lived his life. I was especially moved to discover that in his youth and early adult life Gandhi was an ordinary person and in fact had failed at many things and was full of fear. However, he began to transform himself by using his will when he realized that changing himself was his most important lifelong opportunity. Knowing this about Gandhi supported me to see that I can also do what I need to do while I am in this Earth school. I was ordinary and unconscious for much of my early life. I am aware that my experiments with changing myself have changed the course of my life in ways that continue to delight and surprise me. I have been experimenting for decades with using my will to choose love rather than fear, which means to be courageous enough to be in my integrity when it would be easier to choose something seemingly easier. I am so grateful to know from experience that my ongoing experiments with living an authentically powerful life are the most difficult things that I do and at the same time the most rewarding and joyful. heals everything, and love is all there is."